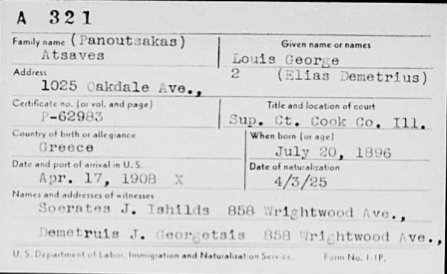 FamilySearch.org has a FREE database titled ILLINOIS, NORTHERN DISTRICT NATURALIZATION INDEX, 1840-1950. 35,804 people have Greece listed as their country of birth. You will be able to view the actual index card which contains all the information you need to be able to order your ancestor's naturalization files. The Illinois, Northern District Naturalization Index, 1840-1950 is NARA publication M1285: Soundex Index to Naturalization Petitions for the United States District and Circuit Courts, Northern District of Illinois and Immigration and Naturalization Service District 9, 1840-1950. This card file is an index to petitions for residents of northern Illinois, northwestern Indiana, southern and eastern Wisconsin, and eastern Iowa. Filed by soundex codes the entries prior to 1906 differ from those after 1906. After 1906 the entries generally include the name of petitioner; address; name of the court in which naturalization occurred; certificate, petition, or other identifying document number; country and date of birth; date and place of arrival in the United States; date of naturalization; and name and address of witnesses. Although space was provided for this information, it is not always present on every card. Index cards for naturalizations taking place prior to 1906 typically contain only the name of the petitioner, the name of the court in which naturalization occurred, document number, country of origin, and the date of naturalization. Naturalization is the process of granting citizenship privileges and responsibilities to foreign-born residents. Most counties recorded naturalization procedures in the court records as legal proof of citizenship. The courts handling naturalizations changed several times so the card index was created as a way to quickly access specific records. Date and port of entry of arrival in U.S.